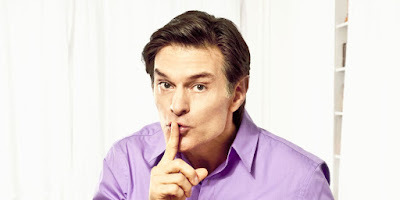 It might seem like a funny place to start, but "the first thing to do is sleep," says Dr. Oz. "If you're not sleeping due to a medical problem — sleep apnea, restless legs syndrome, poor sleep hygiene — address it. Don't think of it as a mere inconvenience: You will not be able to lose weight if you can't sleep." Case in point: Recent research suggests that getting a good night's rest can help reduce cravings. Plus, Dr. Oz adds, "You can't eat when you're sleeping!" Your goal is to "never be hungry," says Dr. Oz, and for most people, the only way to achieve that is to eat between meals. "That's why I'm never without a plastic bag of nuts. It's like a feeding trough," says Dr. Oz. His other go-to: seaweed snacks. "We have them all over the house," says Dr. Oz. "You cannot gain weight on seaweed snacks." Contemplating what you want to eat — even for a couple of seconds — can lead to indulging. (Remember Saturday morning when you opened the fridge and thought, I know! I'll make chocolate chip waffles?) So don't think; when it comes to breakfast and lunch, reach for the same healthy option (or two) over and over again. "For breakfast, I'll have yogurt with blueberries, steel-cut oats or a two-egg omelet," says Dr. Oz. "At lunch, I'll have a salad with a little protein, like salmon or eggs, on top." That said, it's OK to shake things up at supper. "All work and no play makes Jack a dull boy," jokes Dr. Oz. Aim for a rotation of three or four dinner ideas that taste different from what you've eaten earlier in the day. That will keep you from getting tired of your standbys, says Dr. Oz. We all love going out to eat, but if you're trying to stick to an eating plan, ordering off a menu can be tricky. "The chefs want the food to taste really good, as they should," says Dr. Oz, "but to get their desired result, they sometimes use ingredients — like butter and cream — that you would normally be willing to go without." Also, at many restaurants there's a series of temptations — like warm bread — that make it hard to eat healthfully. Cooking at home gives you complete control over what goes into your food. Dr. Oz suggests a two-pronged approach. Part one: Keep a food journal. "It makes you accountable to the most important person — yourself," he says. And it's the perfect place to brag about how good you've been (spare your Facebook friends, please). Part two: Rope in a pal. "You ought to have a diet partner who will check in on you," says Dr. Oz. "He or she should be on a healthy eating plan, too. It doesn't have to be weight-loss focused, but he or she can't be an enabler. You need someone who shares where you want to be."